Throughout the summer months, youth entering 3rd grade in the fall up through this year’s high school graduates will have the opportunity to attend workshops taught by distinguished artists in various media. Most of these will be offered on Thursdays and Fridays from June 7 through Aug. 10 in the classroom of the Hampshire County Co-op and Heritage Marketplace, 56 S. Marsham St., Romney. Below you will find a list of the workshops scheduled so far. More are expected to be added soon. One continuing workshop that grew out of last summer’s arts camp will be a Ukulele Club that will meet every Friday, beginning June 8 at 11 am for 1 hour with lessons and practice under the leadership of Jim Morris. Unlike the other workshops, the club will be open to youth and adults of all ages and of all levels of experience. There will be ukuleles available for use; those who have their own instruments are asked to bring them. Those who are just learning to play will soon find that they are becoming proficient enough to play along with more experienced musicians. 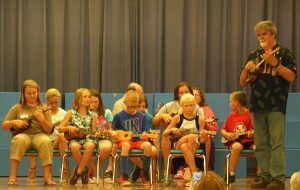 Before the end of the summer, we look forward to having a ukulele club that will be willing to perform for local events! Each workshop will be limited to 12 participants to allow instructors to give their best attention to each student and will require advance registration. The exception will be the Ukulele Club which will be unlimited in size. A special saving offer of $35 is available for the 9 Ukulele Club classes scheduled for the summer. For all other classes there will be a nominal fee of $5 per student per class or 6 classes for $25. Friday, June 8, 1-2 pm: Exploring Composition taught by Sibyl MacKenzie. Students will learn how to make dynamic compositions that draw the eye around the surface, provide balance and elegance, and interest in line and shape can be an intriguing and educational effort. Thursday, June 14 & Friday, June 15, 9:30-10:30 am: Cartooning taught by Robin Pancake. At the completion of this 2-session class, students will have completed their own comic strip. There will be only a single charge of $5 for this 2-session class. Friday, June 22, 1-2:30 pm: Acrylic Painting, Beach Theme, taught by Missy Shockey. In this class students will learn how to blend and dry brush colors on canvas to create their own masterpiece to take home. Friday, June 22, 3-4:30 pm: Acrylic Painting, Dream Catcher, taught by Missy Shockey. In this class students will learn how to blend and dry brush colors on canvas to create their own masterpiece to take home. Friday, June 29, 1-2 pm: “Easy-gami!” paper folding for beginning Origami taught by Nancy Judd. Class size limited to 8. Thursday, July 12, 1-3 pm: Watercolor, 101: Learn the basics of watercolor painting with instructor Barbie Hillenbrand. Get past the fear of painting with watercolor and learn the magic ways behind creating great paintings. Friday, July 13, 1-3 pm: Watercolor – Paint What You See: Learn the basics of watercolor painting with instructor Barbie Hillenbrand. Students will learn to take a deeper look at what they see. Is black really black? Is white really white? To register, please fill in form Registration Arts Adventures Workshops and return with check made payable to HCAC Arts Adventure Workshops and mail to Joanne Snead, PO Box 305, Springfield WV 26763. For additional information, call Joanne at 304-298-3039 or email Joanne_Snead@yahoo.com. Enrollment is limited to 12 students per class, except for Ukulele Club and will be “first come/first serve.” Register early to insure your space!